Greetings! My name is Nathaniel Houghton and I am the Founder and CEO of the Congo Leadership Initiative. It is my pleasure to connect with NAYD and its supporters. I hope to begin a discussion of our shared goal: empowering a new generation of African leaders to create real social change. The Congo Leadership Initiative develops the next generation of leaders to be catalysts for peace and prosperity in the Democratic Republic of the Congo. We are an American organization, but we operate exclusively in the DRC and are led by an amazing group of young Congolese leaders. CLI engenders social change by stewarding the development of Congo’s most valuable resource: its extremely young population. By empowering Congo’s youth to think of themselves as leaders, CLI ensures that the Congo of the future is led by skilled and socially responsible women and men. 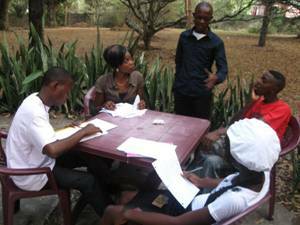 CLI’s long-term goal is to spark tangible social change in all fields through young people in Congo. DRC Policy Analyst Jacques Bahati of the Africa Faith and Justice Network notes that, “The DRC’s main problem is leadership” and “The solutions to DRC’s problems reside inside DRC.” Since 2010, CLI has continuously operated the Leadership Institute in Kinshasa in order to address this problem. To date, CLI has provided 59 carefully selected young leaders with an integrated curriculum to develop and practice their leadership skills to benefit themselves, their communities, and their country. These youth have recruited more than 120 peers to CLI meetings, creating a sizeable community of leaders that is positively changing their country by starting businesses, writing books, and forming youth action clubs. 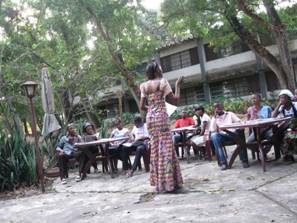 CLI is scaling its impact both by reaching more young leaders in Kinshasa and by expanding geographically across the Congo. In order to increase our impact, we need partners from everywhere in Congo and, indeed, everywhere in Africa. That is why I am so excited to connect with such an amazing group of forward-looking young African leaders. Please email me at nathaniel.houghton@congoleaders.org and we can discuss ways to bring about a more peaceful and prosperous future for all young Africans!